One of the first homes built in the Scandia area belonged to Andrew and Marie Erickson. 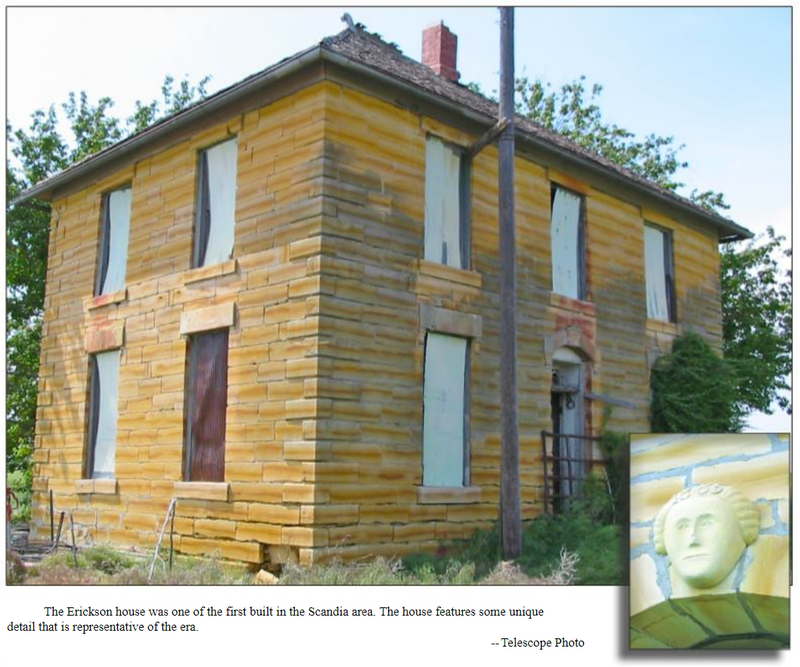 The couple, who amassed a significant amount of land, according to historical reports, hired stonemasons from overseas to built their stone home on their homestead two miles southwest of Scandia. Both the large stone house and the stone barn stand today on land owned by Jeff Strnad, but the house has been empty for decades. The Ericksons moved to the Scandia area from Chicago through the Swedish Agriculture Society, according to Jim Erickson, who is the great-great-great grandchild of the couple. The Ericksons came to Scandia with three children; a fourth was born there. “People said you could go along the river all the way to Sherdahl (located five miles north and west of Scandia) and be on Erickson ground the whole time,” Erickson said of the couple’s land legacy. The patent for Andrew Erickson’s land was issued to Chris Murphy in December 1874. Erickson bought the land from Murphy on June 3, 1876. He hired stonemasons to build his house and barn. He paid the masons’ travel expenses to bring them to America from their homeland, Jim Erickson said. The stone barn was built in 1885, and the house was completed in 1889. “The barn is notable for its many arches and a carved face with the date on one of the arch’s keystones,” said Kelly Larson, who studied Andrew Erickson’s stone house and barn in 2003 as part of her graduate student project. The house is located east of the barn. “The larger, eastern portion of the house is two stories and has a hipped roof,” according to Larson. According to Jim Erickson, Andrew Erickson’s wife, Marie, “was kind of crazy and tried to burn the place down one day.” The fire was put out in time, though, he said, and repairs were made to the house.  Andrew and Marie Erickson’s son, Paul Erickson, had a stone house and barn just to the west of his parents’ home across the creek, but both buildings were torn down a long time ago, Erickson said. Paul Erickson had 13 children, Jim Erickson said, and he raised his large family in a small stone house. Once most of the children left, he finally added onto the house. Andrew Erickson’s daughter, Louise, married Thure Wohlfort, who later owned a significant portion of land just south of Scandia. The Wohlforts built “The Wohlfort Place,” – later known as SK Ranch. The Wohlforts built a modern, large stone house, a large stone barn, and other stone outbuildings that stand in use today. Jim Erickson said Thure Wohlfort got much of his land and success because of his father-in-law. Arlene Swanson and her late husband, Harry, lived in the Andrew Erickson stone house for about three years. Her husband worked for SK Ranch – short for Harvey Sandell and Ed Kunze – which was the name given to Thure Wohlfort’s properties years after his death. Because Andrew Erickson was Wohlfort’s father-in-law, the Erickson property became part of the Wohlfort property through inheritance. Swanson said the stone house was “in good shape” when she lived there from about 1957-1960. Swanson said the home, which had deep windows, was heated with a wood stove. A propane stove was added during her time in the house. “We lived there probably 12 to 18 months without a bathroom,” she said, adding that the home only added the modern convenience in about 1958. The bathroom was built next to the kitchen, she said. She said the downstairs had a “good-sized” kitchen inside the south door of the house, which was the front door. The first floor also had a dining room, bedroom and stairway. The upstairs had three rooms. Swanson said she slept in the upstairs bedrooms and her children slept downstairs. Southwest of the house is a stone barn. 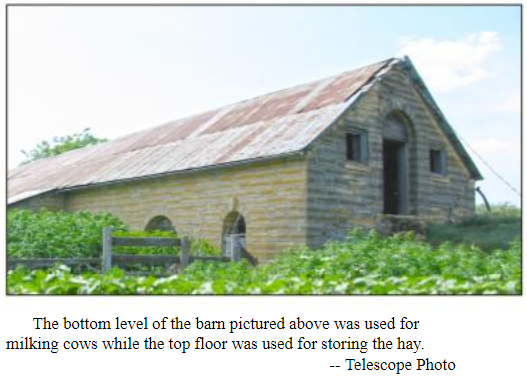 The bottom level was used for the milk cows – Swanson said the family had a few – and the top floor of the barn was used for hay. Swanson said she can’t remember who lived on the farm, which her family referred to as “The Sandell Place,” before her family moved in. Jim Erickson said he thinks only one more person lived in the stone house after the Swansons moved out. An SK Ranch- hired man whose name Erickson said he can’t remember lived there for only a few years before the house was permanently empty by the mid-1960s. The land was passed down through the Sandell family until it was sold to Jeff Strnad in October 2001. Click below to view other ‘Set in Stone’ features.